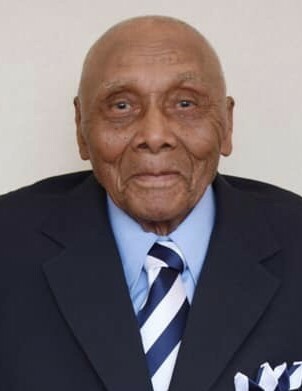 Mr. Tommie Burroughs, age 105, passed away on Monday October 8th at the East Georgia Regional Medical Center after a brief illness. He was born on October 23, 1912 in Bulloch County to the late Spencer and Laura Burroughs and was the ninth of ten siblings all which preceded him in death. He was a member of Mount Pisgah AME Church where he served faithfully as the head Steward until his health failed. He was a member of the Masonic Truthful Lodge #375 where he served as a secretary for over 25 years and a member of the Goodwill and Charity Lodges No. 2 and 3. He leaves to cherish his loving daughters Mrs. Verlene (Willie) Underwood of Cincinnati, Ohio, and Mrs. Catherine Williams of South Bend, Indiana; a loving son Mr. William (WT) Burroughs of South Bend, Indiana; a loving grandson he raised Mr. Wilbert Burroughs of Metter, Ga.; 14 grandchildren, 46 great grandchildren, 34 great great grandchildren, and a host of nieces, nephews, and other relatives and friends. Viewing will be held Friday October 12, 2018 from 3-8pm at the Craig R. Tremble Funeral Home, Statesboro Chapel. Home Going Celebration for Mr. Tommie Burroughs will be held Saturday October 13, 2018 at 1pm at the Johnson Grove Baptist Church, 149 Johnson Grove Church Road, Portal, Ga., with the Rev. Larry Cone, Officiating and the Rev. Maurice Hill, Pastor. Interment will be held in Church Cemetery. Mr. Tommie Burroughs will lie-in-state from 12pm until funeral hour. There will be no viewing after eulogy.